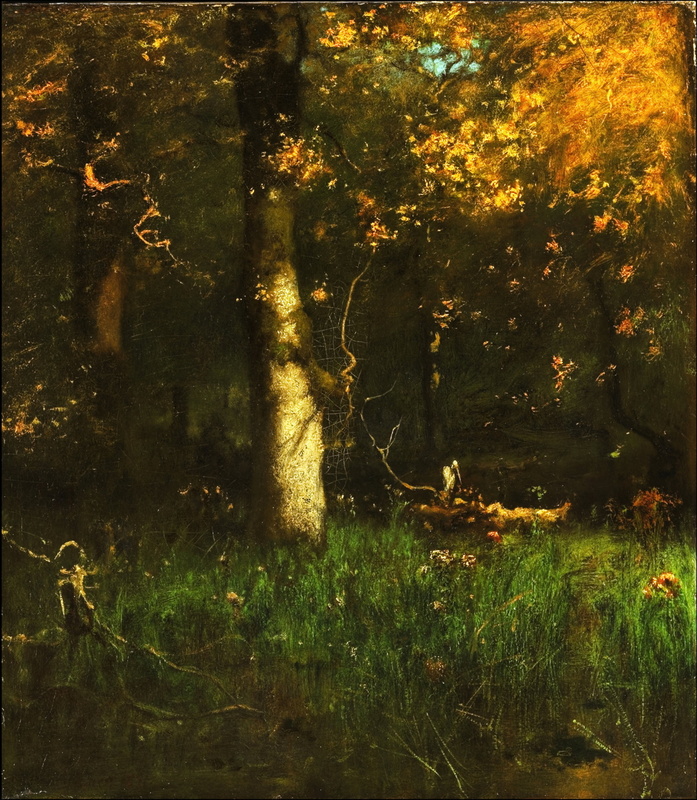 George Inness, Woodland Pool (1891), oil on canvas, 63.7 x 76.4 cm, The White House Collection, Washington, DC. Wikimedia Commons. If impressionists in Europe have been largely forgotten, the situation with American painters in the nineteenth century could not be more different: there are many, and I am delighted to say that several are still held in high regard today. We therefore have some riches to come in the next few articles in this series, as I consider them in order of date of birth. Born near Newburgh, New York, in 1825, he grew up in and around Newark, New Jersey, and New York itself. He studied briefly with an itinerant painter in 1841, and with a French artist in New York in 1843. He also took classes at the National Academy of Design, and studied the Hudson River School (with which he is today often associated). His first painting was shown at the National Academy of Design in 1844, and he opened his first studio in 1848, in New York. He obtained patronage to enable him to travel to Rome in 1851, where he studied the paintings of Claude Lorrain and Poussin. He also travelled to Paris in the early 1850s, where he was influenced by the Barbizon School. He consequently developed a Barbizon style, but remained a realist. He moved his studio to Medfield, Massachusetts, in 1860, then to Eagleswood, New Jersey, in 1864. 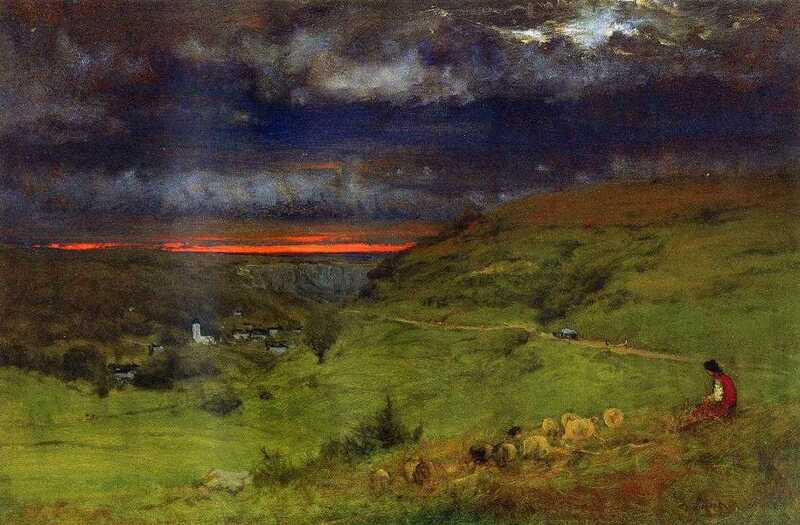 George Inness, Across the Hudson Valley in the Foothills of the Catskills (1868), oil on canvas, 38.1 x 66 cm, location not known. Wikimedia Commons. He became a follower of Swedenborg, and his paintings were most influenced by Corot. Among his particular skills was the ability to paint detailed landscapes from memory, although at that time this was not an unusual artistic objective (there were even instructional texts which promoted this). In 1870 he visited Italy, touring Rome and Venice, and he returned to Italy and France during the 1870s. However his paintings of the famous coast at Etretat must have been the most conservative of their day, with its popularity among the French Impressionists at the time. George Inness, Sunset at Etretat (c 1875), oil on canvas, 51.4 x 76.8 cm, Private collection. Wikimedia Commons. 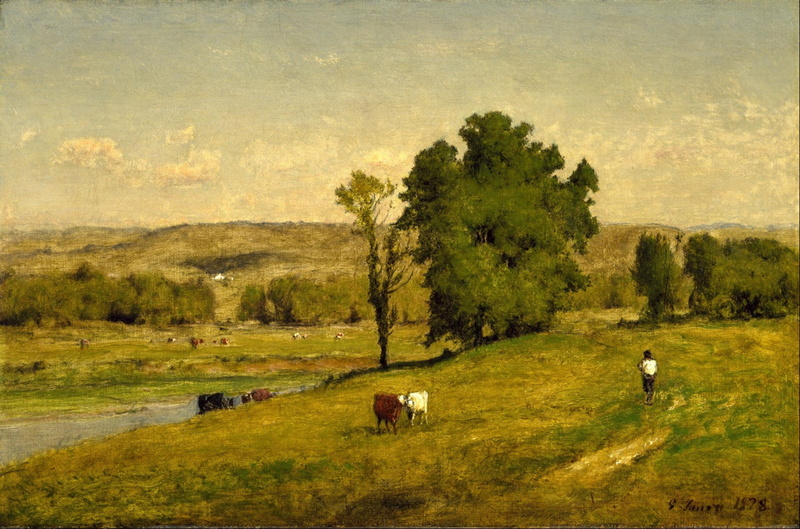 George Inness, Landscape (1878), oil on canvas, 30.2 x 45.7 cm, Museum of Fine Arts, Houston, TX. Wikimedia Commons. In 1878 (or possibly 1885) he moved to Montclair, New Jersey, where his studio remained for the rest of his life. During the 1880s his paintings became increasingly impressionist in style, with looser brushwork, softer edges, and less realist detail. 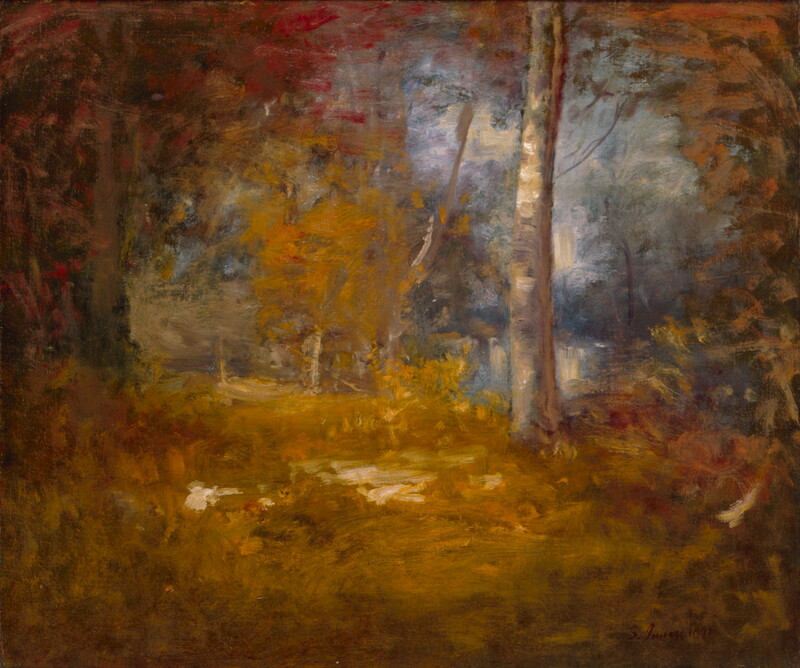 Although he still used dark passages in many of his paintings, and remains known as a tonalist, his colours became even bolder, and light came more to the fore. He also started to paint landscapes in which figures were larger and a more significant part of the whole. 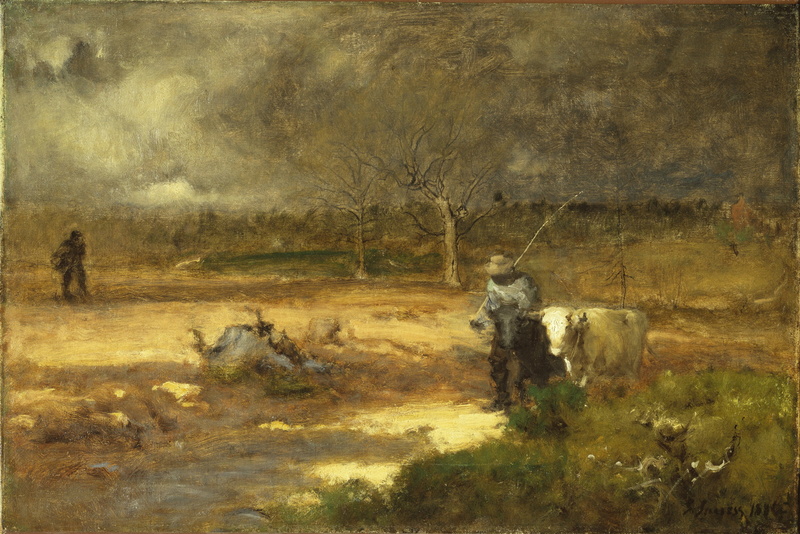 George Inness, Homeward (1881), oil on canvas, 51.4 x 76.8 cm, Brooklyn Museum, NY. Photo by shooting_brooklyn as part of Wikipedia Loves Art, Wikimedia Commons. 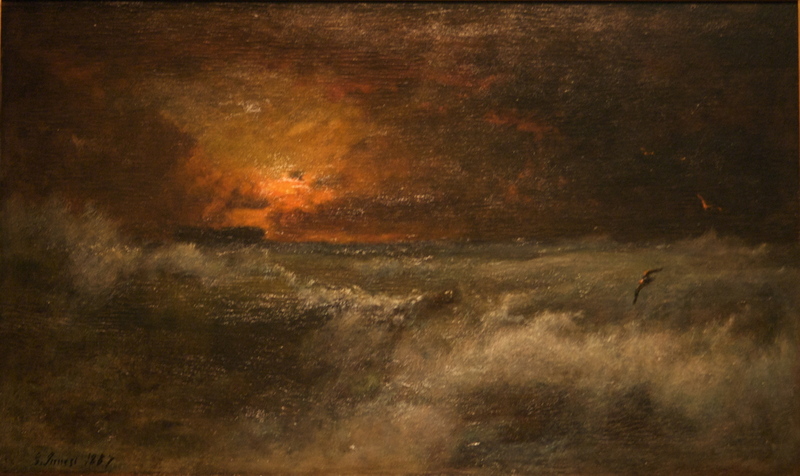 George Inness, Sunset over the Sea (1887), oil on panel, 56 x 91.8 cm, Brooklyn Museum, NY. Photo by dmadeo as part of Wikipedia Loves Art, Wikimedia Commons. 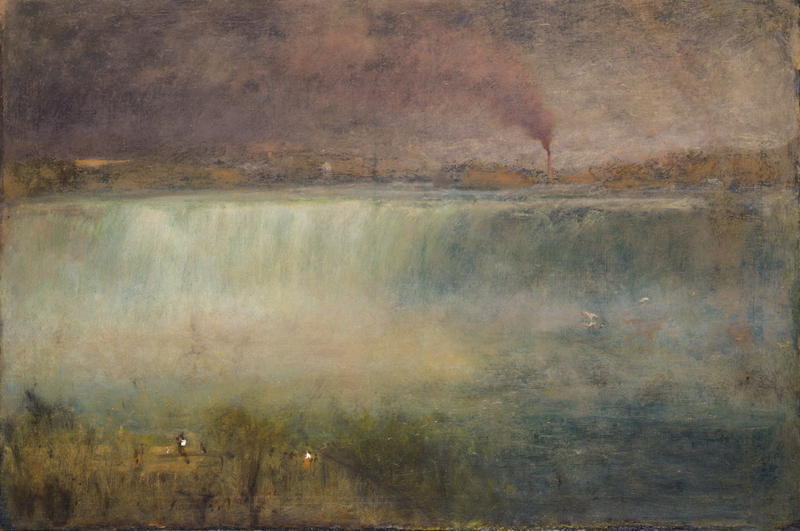 George Inness, Niagara (1889), oil on canvas, 76.2 x 114.3 cm, Smithsonian American Art Museum, Washington, DC. Wikimedia Commons. He overcame much of the earlier criticism which had been directed at his work; this was helped by a major retrospective exhibition by the American Art Association in New York in 1884, and in 1889 he was awarded a gold medal at the Paris Exposition. 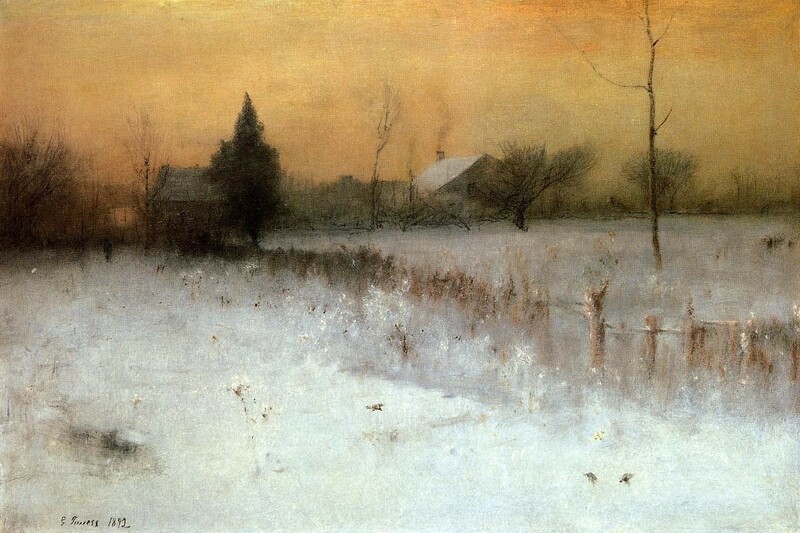 George Inness, The Home of the Heron (1891), oil on canvas, 107 x 94 cm, Princeton University Art Museum, Princeton, NJ. Wikimedia Commons. By 1890 his paintings had become quite overtly impressionist in style, with very loose brushwork. However through most of his work, Inness maintained quite formal composition, with mathematical and geometric underpinnings. In the 1880s, he was also keen to make it clear that he neither considered his work impressionist, nor did he agree with the Impressionist model of perception. 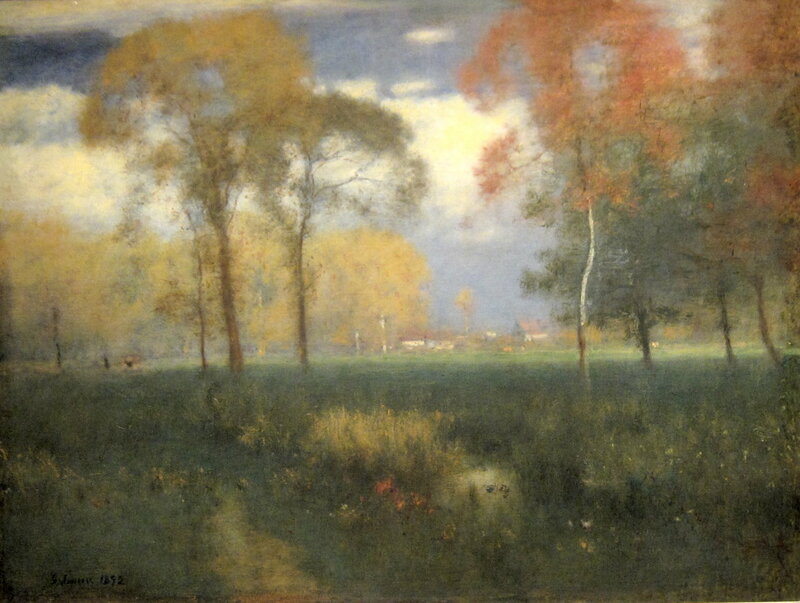 George Inness, Home at Montclair (1892), oil on canvas, 76.5 x 114.3 cm, Sterling and Francine Clark Art Institute, Williamstown, MA. Wikimedia Commons. 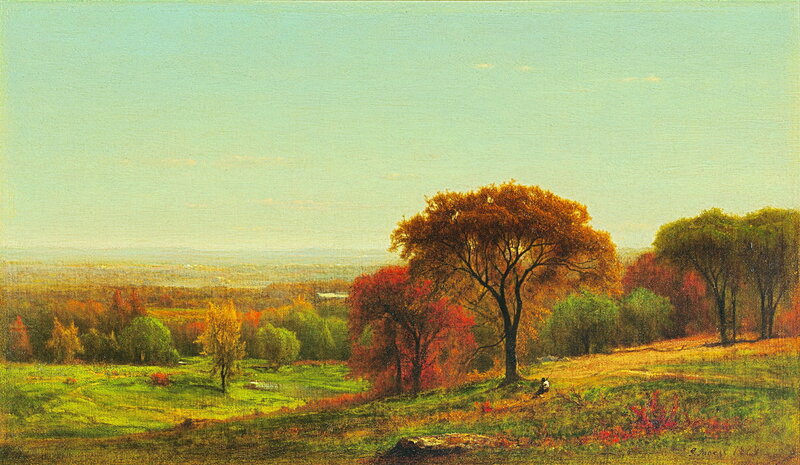 George Inness, Sunny Autumn Day (1892), oil on canvas, 81 x 106 cm, Cleveland Museum of Art, Cleveland, OH. By Wmpearl, via Wikimedia Commons. He died in 1894, while visiting Scotland. Today, many consider him to be the father of American landscape painting. Whatever he maintained about the ordered nature of his paintings, the evidence is that he progressed from realism through Barbizon to full impressionist style, at least in his facture. And he remains one of the greatest American landscape painters. Posted in Painting and tagged Barbizon, Claude, Corot, Impressionism, Inness, painting, Poussin, USA. Bookmark the permalink.